A definitive benchmark in the realm of haute horology, we highlight some of the iconic Manufacture’s most covetable offerings..
Power, precision, panache, perfection — these are but a few of the attributes that come to mind when one thinks of the legendary House of Breguet and its horological masterpieces. Its offerings have, from the genesis of the pioneering brand in 1775, been endowed with an incomparable finesse and unmatched technological prowess. Time stands eloquent testimony to the fact that Breguet’s timepieces have been created with consummate care and an overpowering passion that has succeeded in redefining the art of telling time in numerous, unimagined ways. The Manufacture’s remarkable timeline — one that is marked with incredible ingenuity and inspired innovations — is ample proof of the way the legendary brand has shaped the world of watchmaking with intricate craftsmanship. Effortlessly, the House has established its prime position as the acknowledged leader in ultra-high quality watchmaking. And its collections — over the years, decades and centuries — have defined and determined the aesthetics and technology of haute horology, in the same spirit as its founder Abraham-Louis Breguet did so many years ago. The genius of the farsighted Swiss watchmaker-entrepreneur is unparalleled. It is no wonder then that the man who changed the course of telling time continues to be known as ‘the watchmaker of the kings; the king of the watchmakers’. The acknowledged influence of Breguet draws from its artistry and designs that are driven by the spirit of extending one’s creative limits and raising the bar with every new offering. This driving philosophy is a result of the passion of the founder who had quietly opened his workshop at 39 Quai de l’Horloge on Paris’ Ile de la Cité almost at the close of 18th century. And it continues unquenched to the present day, inspiring the brand to shape and reinvent the art of telling time. By the time the new millennium dawned, Breguet’s production had grown beyond its humble origins and was — and continues to be — carried out in over a dozen diverse workspaces. Today, its watches are crafted in the Vallée de Joux, which is globally renowned as the centre of advanced mechanical horology. Its daily processes are executed and supervised by skilled workers who, with their eye for accuracy and finishes, give each element its uncompromising quality. The fine horology is enhanced by a plethora of processes. It is this attention to the minutest detail that has lent the House its many firsts, and lasting credibility. So Breguet can proudly — and rightly — boast of many firsts to its credit — the very first tourbillon and the first wristwatch (created for the Queen of Naples) years ago, to the more recent magnetic regulator and magnetic pivot. Breguet is also credited with the genesis of innovations like the self-winding watch, the gong within the minute repeater and the shock absorption system. And the House also showed a great deal of originality when it unveiled to the world the first instant dual time-zone device — a function that continues to be a boon to contemporary globetrotters. More recently, it even patented a chronograph mechanism including its own energy accumulator and regulating system, with a gear train connecting the two. Each Breguet movement presents a unique combination of different finishes. 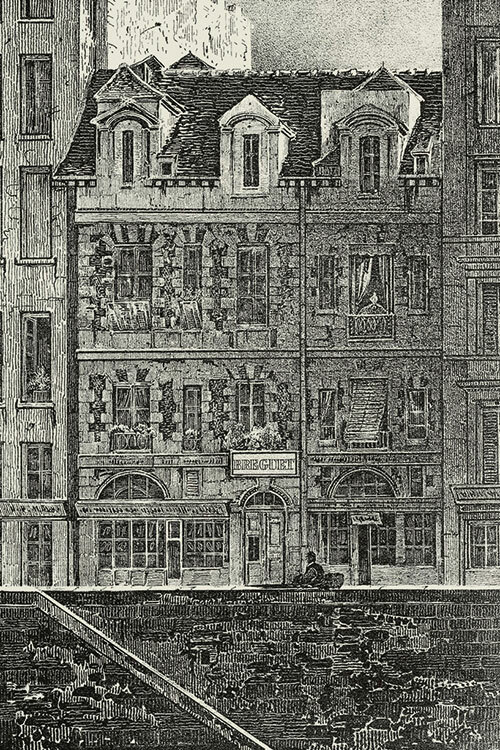 The legendary watchmaker’s motifs were employed for a particular purpose. And for the finishes he perfected, the principal criterion was overcoming the effect of impending oxidisation and corrosion. From the days of the early grenaillage (fine graining), the transition to new features happened over a long period of time. The contemporary range of finishes that is bestowed upon the movement is done for several reasons — some functional, others aesthetic. But all are linked with supreme quality and intrinsic value, representing an integral part of watchmaking traditions that have been perfected by Breguet. Ahead of its time in several ways, the House continues to inspire master watchmakers and connoisseurs today, as a status symbol and a towering testament of imagination, ingenuity, drive and skill. Through its founder’s resourcefulness, it has changed the game (and continues to do so) with several strokes of genius. Interestingly, even as it continues to blaze an inspired trail into the future, it has creatively retained — and nurtured — a symbiotic and invaluable connect with the past and its legacy. 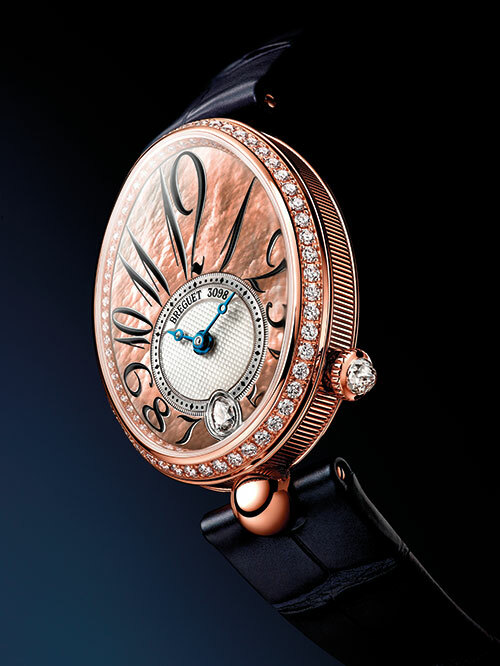 This is seen beautifully in collections like The Tradition that are an eloquent homage to the memory of A-L Breguet. The Tradition timepieces hint at a return to the brand’s original design codes even as the collection encompasses its vision for the future. 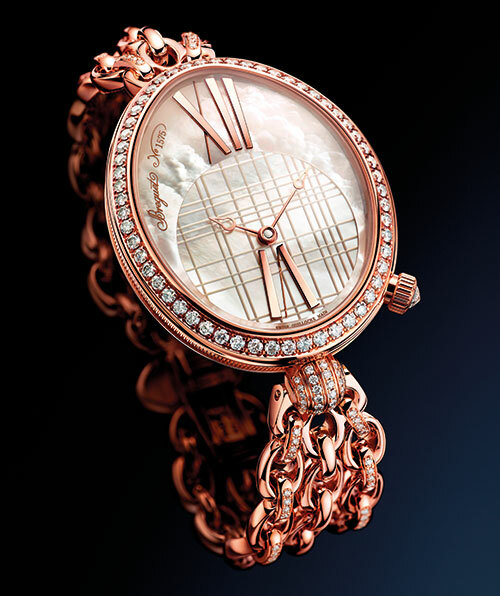 In a similar vein, Breguet’s Reine de Naples collection is a beautiful paean to the past. 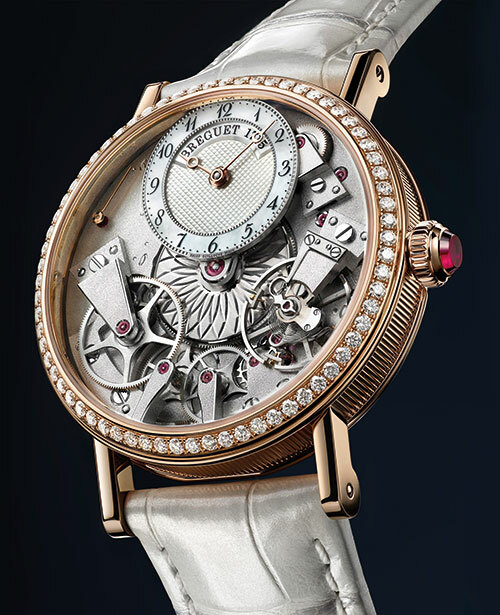 Inspired by an early bracelet watch that Breguet himself created for Napoleon Bonaparte’s sister Caroline Murat, the Queen of Naples, the House’s manufacture has conjured up a vision of feminine grace in the form of an alluring jewellery watch that any woman of grace would love to sport as a wristy adornment. 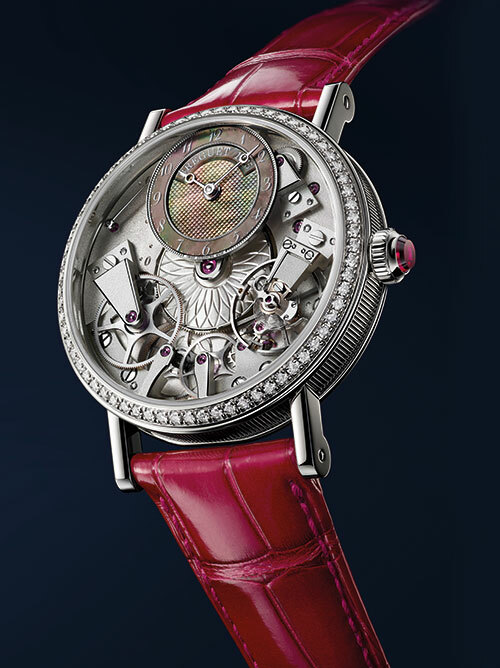 The Reine de Naples collection boasts of a strong synergy between technological advances and grace fit for a queen. 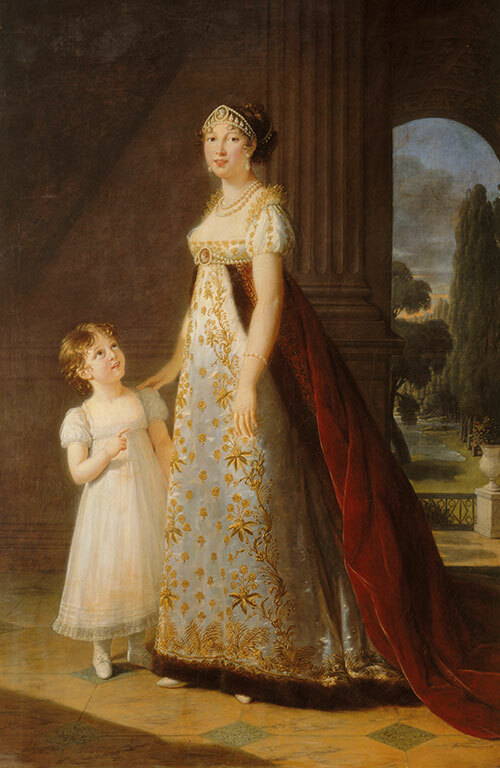 Speaking of royalty, no narration of Breguet’s glorious lines will ever be complete without a mention of the revered patrons who were the House’s devoted loyalists. The legendary watchmaker was a fond favourite of not only the Queen of Naples, but was also preferred by Louis XVI and his famous queen, Marie Antoinette. And, in modern times, Breguet’s timepieces have been proudly worn by eminent personalities like Sir Winston Churchill, George Washington and the crown heads of Europe and Asia. It can be said with undoubted verity that the House’s following effortlessly straddles centuries and continents as it continues to interpret the art and craft of telling time ingenuously with its aesthetic designs, iconic elements and mechanical innovations! This avant-garde icon has not only maintained a stellar reputation for technological expertise, but has also consistently pushed the boundaries of artistry to leave an eternal imprint on the world of fine watchmaking. Glimpses of Breguet’s glorious past, present and way into the future can be seen at the Breguet Museum, located on the first floor of the Breguet Boutique at 6 Place Vendôme, Paris. It hosts and proudly presents invaluable documents and artefacts related to the history of the House of Breguet — a visible statement of its timeless glory. Paying tribute to the first wristwatch created for the Queen of Naples, the new Reine de Naples Mini 8928 models feature a diamond-set bezel, flange and folding clasp, along with a pavé diamond lug and a winding crown topped with a briolette-cut diamond at 4 o’clock. Bold Arabic numerals adorn the dial in black on the rose-gold version with a black satin strap, while the white-gold one sees them enhanced by a stunning pink outline that matches its vibrant leather strap. The contrast between the soft curves of an 18-carat rose-gold oval case and the graphic lines of an engine-turned mother-of-pearl dial ensures that the Reine de Naples Princesse 8965 offers an irresistible blend of grace and boldness. Two large rose-gold hour markers at 6 and 12 o’clock make a strong statement, enclosed by a diamond-set bezel, a radiant crown set with an inverted diamond and a lug set with brilliant-cut diamonds. Powered by the 591C calibre, a mechanical self-winding movement, the watch is held either by an alligator leather strap with a folding clasp set with brilliant-cut diamond or a rose-gold link bracelet set with 104 brilliant-cut diamonds. Tahitian mother-of-pearl takes centre stage, complemented by a white mother-of-pearl engine-turned offset dial and large Breguet numerals, in the newest version of the bestselling Reine de Naples 8918. 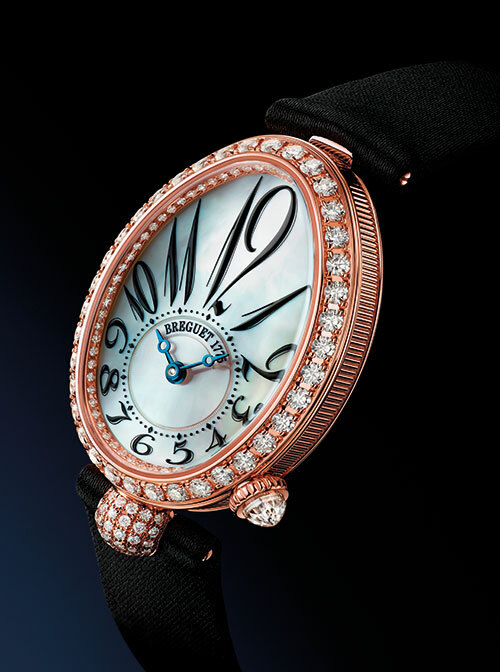 The rose-gold ovoid case with its delicate fluted case band is set with 117 brilliant-cut diamonds on the bezel and flange, in addition to a briolette-cut diamond on the crown and an iridescent pear-shaped diamond at 6 o’clock. 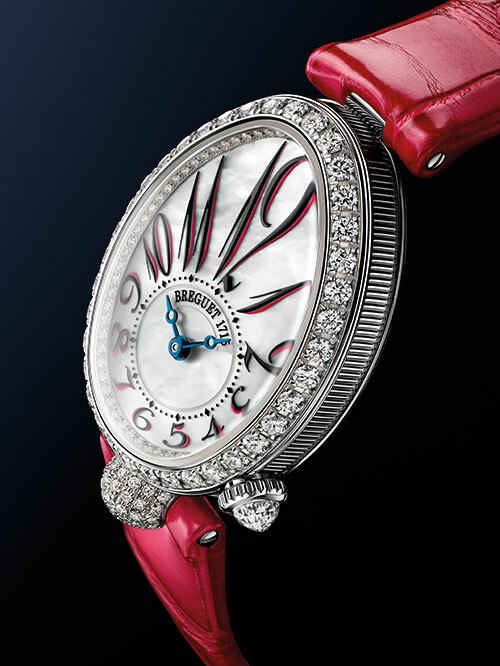 The first ever Tradition model for women, the Tradition Dame 7038 makes a remarkable impression. The timepiece’s ultra-modern structure flaunts a central barrel and subdial at 12 o’clock, while a balance-wheel and intermediate wheels form an arc stretching from 4 to 8 o’clock. Its bezel is set with 68 brilliant-cut diamonds and the crown is topped with a synthetic ruby to match the ones displayed in its self-winding movement. Elegant and precise, the watch is available in a white-gold version with a blue-grey mother-of-pearl dial and a pink-gold version with an iridescent white mother-of-pearl dial — held by bright pink and white leather straps, respectively.